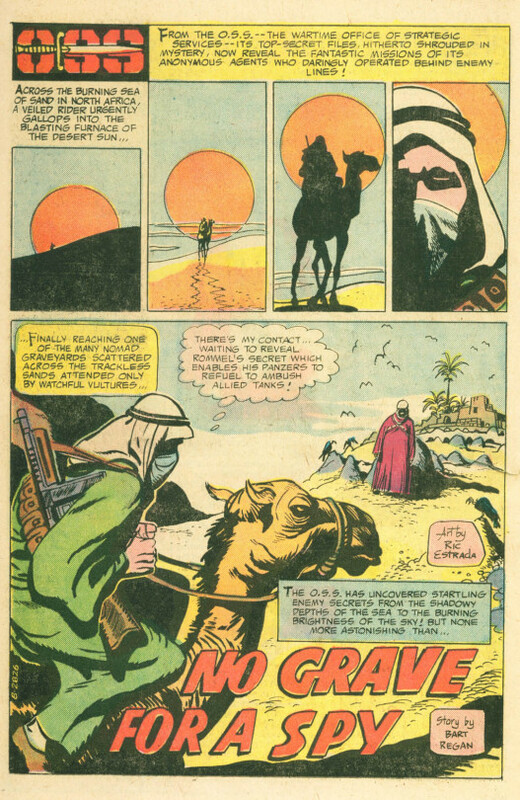 This story, like most of DC’s war comics, was written by Bob Kanigher. 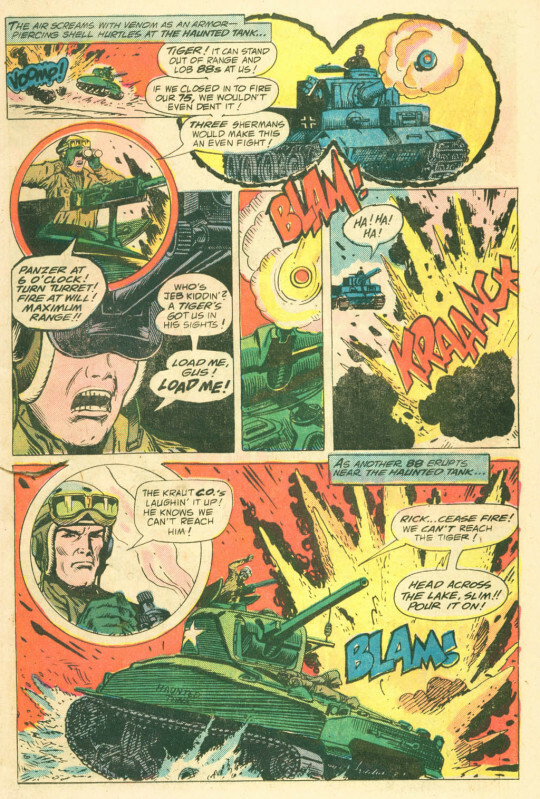 Kanigher was a bit of a character, simultaneously dismissive of the medium in which he toiled but also ultimately confident in his own skills and ability. 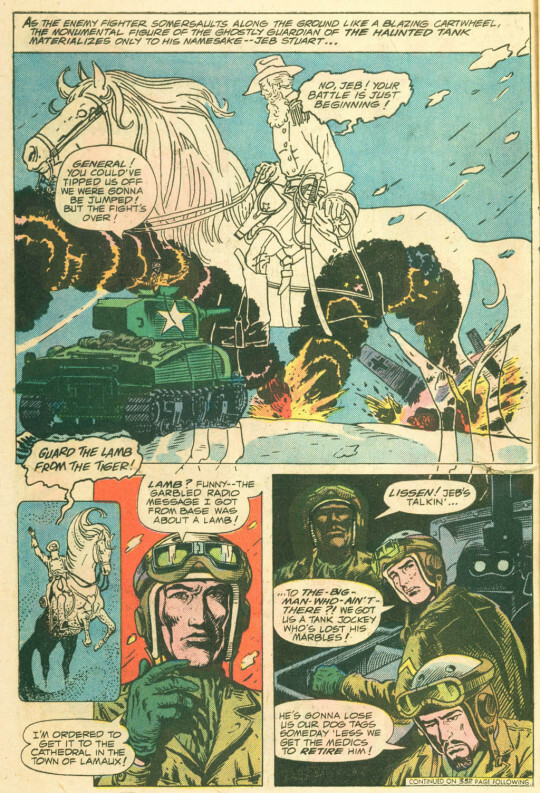 His war stories often followed something of a formula, with either some object or some new character entering the sphere of the main recurring cast and showcasing them and the ultimate futility of war. 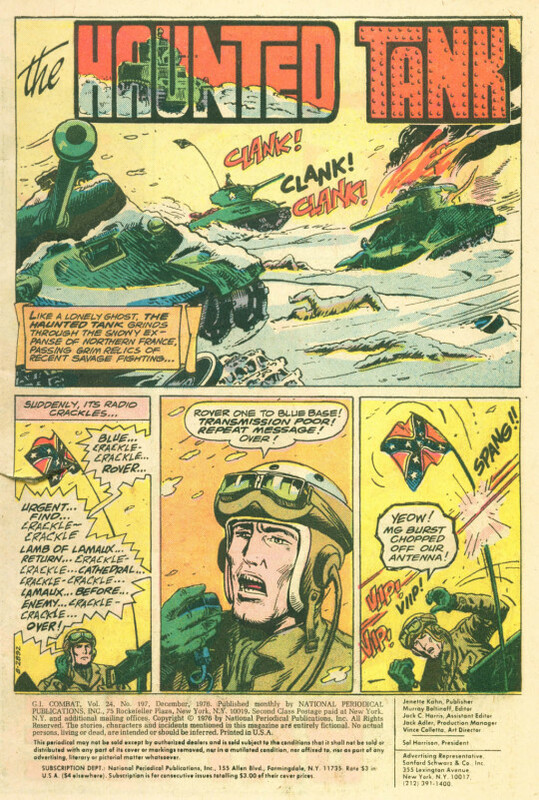 I couldn’t hazard a guess as to how many such stories Kanigher wrote for the DC war books, but it must number in the thousands. In this instance, the Haunted Tank is in Northern France, and tasked with retrieving the Lamb of Lamaux, despite not being able to make out what it is in the fragmented broadcast through which they get their orders. General Stuart’s ghost warns Jeb to guard the Lamb from the Tiger. As the Tank moves through fight after fight, it takes on additional passengers–a kid with a pet lamb as well as a mother and baby from Lamaux. And they’re stalked by an enemy Tiger tank, and forced to take evasive action, their smaller armaments unable to pierce the enemy’s armor. Upon reaching Lamaux, Jeb lures the enemy into a nearby storefront, where it crashes through the floorboards which are too weak to support its 50-ton weight. 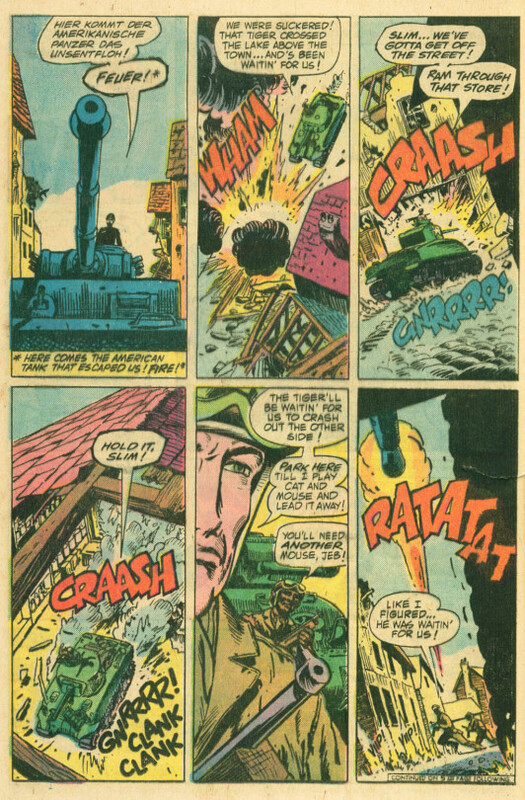 Then Jeb lobs grenades into the exposed Tiger from the rooftop, destroying it. And it turns out that lamb isn’t the child’s pet, but a priceless portion of a stained glass window that depicts a lamb, which the young mother has concealed as her baby the whole time. 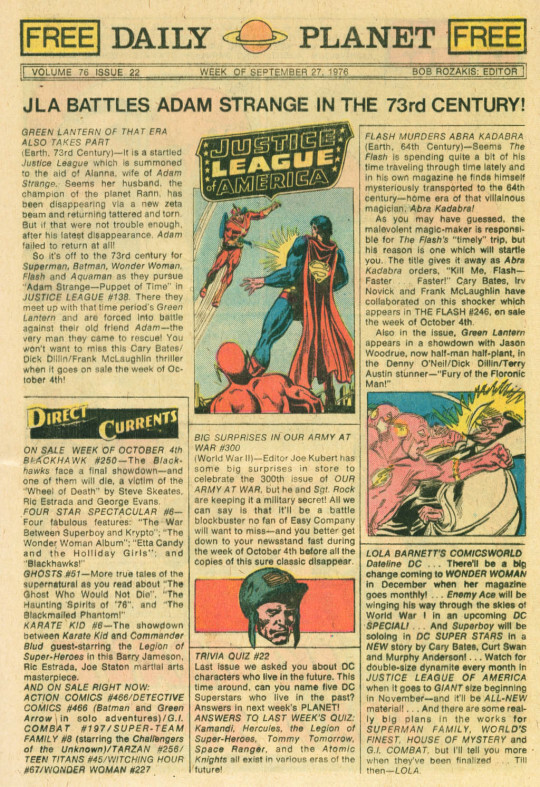 Next came the Daily Planet page, which gave me the heads up that I should start watching my mailbox, as new issues of both FLASH and JUSTICE LEAGUE OF AMERICA were about to be released. Additionally, buried in the Lola Barnett gossip column was the news that JUSTICE LEAGUE was going to be expanding to become an oversized giant series on a regular basis, with exclusively all-new material. This was a pretty exciting development, though I worried about how this change would affect my subscription. The back-up story was a tail of the O.S.S., a series that served as a bit of a catch-all, with no continuing characters. There isn’t much plot–an O.S.S. operative in North Africa discovers that is contact has been discovered and killed, and so his mission to locate Rommel’s supply line is scotched. But as he survives a series of encounters as he escapes the area, the spy eventually comes upon Rommel’s secreted fuel depot in a graveyard, allowing the Allies to deprive him of it and stage a counter-attack. As World War II was ancient history to me, even though it had only been a bit over thirty years, I never could quite grasp the stakes in stories such as these–and so, it just read to me as a series of events without any particular outcome of note. Decently crafted, but nothing I wanted to read on a regular basis.